Create the perfect horse! 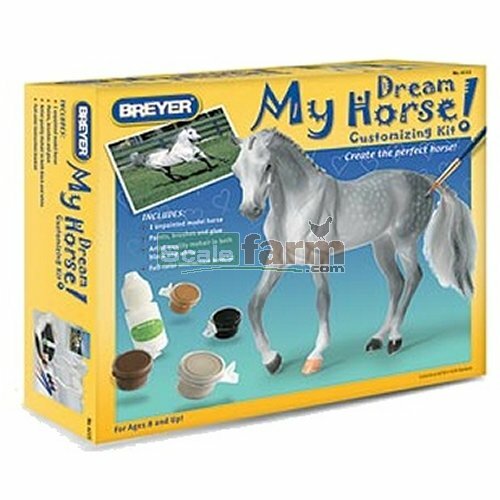 Whether you love pintos, appaloosas, or just want to get creative, this kit gives you all the tools you need to create your dream horse. Simply choose a colour for your horse's coat from the pallet of acrylic paints, or mix a new and exciting one. Add a mane and tail of black hair or white hair or a combination of the two. Full instructions are included for you to follow to get real-looking results. This customizing kit includes: One unpainted model horse, six colours of acrylic paints, three paint brushes, glue, black mohair, white mohair and a full colour instruction booklet.